No, you didn’t read that wrong. I’ll give you a moment to recover from your shock. Then once you stop either laughing or cursing, consider this – this is purely a publicity stunt. 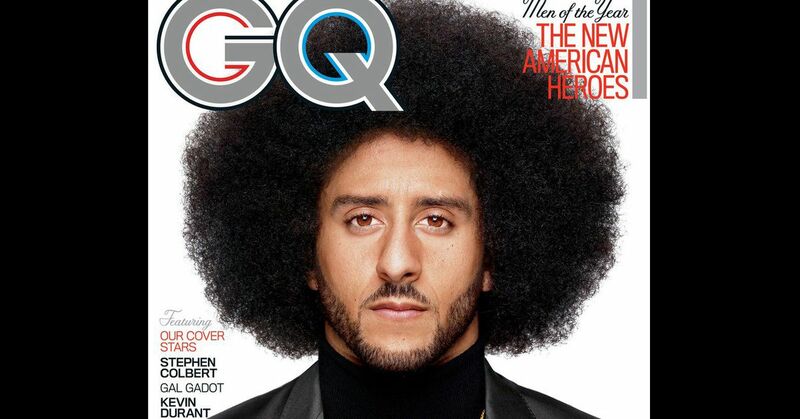 GQ may want it to seem like they are standing behind an activist or promoting a certain cause or side of an issue, and with the “Citizen of the Year” award it appears that way. For those of you confused at why GQ is giving a “citizen” award to flag-hating Kaepernick, I guess their previous “Men of the Year” awards were sexist so they needed to include women too. A man’s magazine, promoting and honoring men – oh the horror! A magazine known for bringing the “metrosexual man” into the public conscious, of course has it’s liberal agenda. Like Hollywood, or even the NFL, they seem to think they will beat the rest of us down into believing the same as they do. That they will convince us that their self righteous views are the right way, and only way, to believe, and the rest of us are terribly wrong, ignorant, and even hateful. And so they continue to dig in their heels. Unfortunate for them that these “ignorant” masses, these deplorables, aren’t falling in line. Instead of changing course, or backing off and just sticking to their job, which is entertainment, not politics, many are doubling down. What has resulted, is something they never expected and something they can’t seem to comprehend – the masses are turning them off. Sales and Viewship from football, to the movies, to even the Oscars, are all at all-time lows. This has left many celebrities and moguls scratching their head. The self-righteousness of their views can’t allow them to see the folly of their ways. They know best, and they tell us through the screen what is right, what is good, and anyone who dare disagrees, is not only wrong, but practically evil and should be destroyed. That in itself explains why so many still won’t stop preaching their liberal views through their medium, even as the walls come crashing down around them. Liberal open-mindedness in entertainment is basically “You are free to express your views as long as they match my liberal views. If you disagree, then you are evil and need to be silenced.” These entertainment/media liberals would have thought by now that they would have beat the masses into submission, for the sake of their addiction to entertainment and the media, Yet it’s these “deplorables” who are having the bigger impact on society. Instead of pausing for some inner reflection, these entertainers continue on their suicide mission to tell those who employ them, who pay their salaries, what is the right and only way to believe That self-righteousness is sinking an industry. Back to GQ, the print media world has been suffering for years with the rise of the internet. This latest battle of political wills hasn’t helped them. Condé Nast publishing which owns GQ has been steadily declining in sales the past few years. In fact its biggest decline were numbers released earlier this year – a 6% drop in sales. As the old saying goes “There is no such thing as bad publicity” – and that is just the case here. GQ, and the company behind them, is desperate for attention. Honoring one of the years most controversial figures is one way to get media attention, and they hope, a bump in sales, esp in this last quarter of 2017. It’s their way of saying “Hey, look at us! You may have forgotten we exist, but we’re still here! Check out our magazine!”. Sadly this tactic may have worked even just a few years ago, but we have seen time and time again, the failure of such tactics of companies across the board, be it a purpose of publicity or their version of self righteous promotion of their views. Many companies have banked on the fact that if they push their views long enough, the people will give in, because how could the masses go for months without watching football, or going to a movie, or watching the latest Hollywood award show? All you have to do is ask many of the major entertainment companies, and even the NFL, how that mentality has worked out for them lately. This season alone, audiences of NFL games are down by 7% and that is on top of 8% last year. Think it’s just sports? Well, Hollywood suffered one of the worst Summer Box Office totals. It’s been called a “historic decline”. Summer 2017 saw the steepest box office decline in modern times for North America, with almost a 16% drop in revenue. 2017 was also the first time that the summer box office revenue, since 2006, didn’t pass the $4 billion mark. GQ is using an old playbook to generate controversy. The magazine may get some publicity through shock appeal but it will do little to drive sales. In fact, they may even learn that nowadays, there actually is such thing as bad publicity.